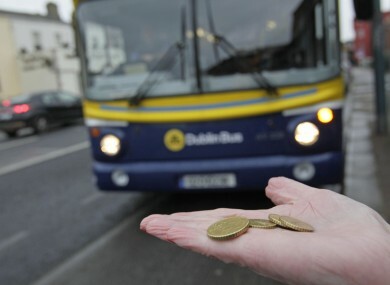 THE LABOUR COURT has recommended Dublin Bus staff be given an 8.25% pay rise over three years. Workers at the company had sought pay rises of up to 30% in order to bring them in to line with Luas drivers, but have been told they should be paid less than a third of that. The head of the National Bus and Rail Union Dermot O’Leary said they are “disappointed” with the recommendation because the deal would come in under what Luas drivers were given. “Whilst acknowledging the difficulties the Labour Court was presented with in deciding on what level of pay was appropriate, given the eight year hiatus since bus workers’ last pay increase and pay cuts that were foisted on staff in the intervening period. “It is disappointing that the court has apparently decided not to follow its own guide in not awarding a similar increase of at least 3.8% per year which it awarded to others in the same sector as recently as last month in settling the Transdev dispute. We went on record in advance of the resolution of the Luas dispute indicating quite clearly that we would expect similar treatment with regards to bus and rail workers, we also said that we required the pay gap between bus and tram drivers to be addressed as a component of our members’ pay claim. The NBRU argues that its 31% claim would bring Dublin Bus staff into line with Luas drivers. They say this would make Dublin like other European cities where bus and tram drivers are paid broadly the same. O’Leary went on to say that while he had respect for the Labour Court, he was tasked with representing his members. “The NBRU has the utmost respect for the State institutions that are tasked with resolving industrial relations disputes, however our role in lending a voice to the frustrations of bus workers has to take precedence at this juncture. Whilst it will ultimately be for our members to democratically decide whether the level of pay reward recommend is adequate, we cannot rule out the spectre of industrial action in the coming weeks and months should they reject this recommendation. Dublin Bus could not immediately comment, but a response has been sought by TheJournal.ie and will be added in due course. Email “Labour Court recommends Dublin Bus workers get a lot less than 30% pay claim”. Feedback on “Labour Court recommends Dublin Bus workers get a lot less than 30% pay claim”.